La Trobe University has a fine history as an excellent university with an enduring social conscience. As part of our Future Ready strategy, our plan is to grow and develop La Trobe's traditional leadership in areas of research, scholarship and learning that matter to the Australian community. These sensing and imaging technologies will play an important role in the age of digital health and personalized medicine. Application areas include Agri-tech Med-tech, Defense, Smart Cities, Energy and Transportation and Logistics. Our clients come to us to apply new technologies to their existing problems, which usually starts with a feasibility verification and can consequently result in prototype development, field trials, market ready product development and integration with legacy systems. The Research Centre for Data Analytics and Cognition (CDAC) aims to advance the paradigms of business analytics and data science. The La Trobe Business School’s new research centre will bring together a team of experts in data analytics and technical capability in IT, providing the Centre with the capacity to carry out fundamental research in data mining, machine learning and cognitive computing. provide, receive and disseminate information in the areas of the centre. Their vision is to be one of the world’s leading centres in mathematical and statistical analysis, design and optimisation of complex systems, and to apply that research for scientific, economic, social and environmental benefit. 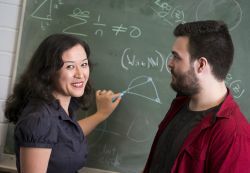 The Centre also aims to reinforce the importance of mathematics and statistics across the spectrum of Australia’s scientific and technological development by maintaining an extensive and vigorous outreach program, encompassing schools, commerce and industry, and the broader research community in Australia.